Good tools are essential to any job, and work in the garden is no exception. I’m one of those girls that likes a good workout session with a garden fork, but the longer I garden, the more I find small tools get most of the work done. For my last birthday, my best friends gave me a tub of Japanese gardening tools. Wow. Based on how awesome these tools are, I’m thinking from now on we leave making all cars and gardening tools to the Japanese (that’s a joke, my Buy American friends). Pictured above are my absolute favorites: a handheld three-tined digging fork, a nejiri garden hoe, and a handheld pick-mattock. Perhaps my soil is finally getting to the point where light cultivation is all that’s needed to keep it in decent shape, or perhaps I am just so tired from gardening with a baby on my back that a less physical kind of works appeals to me. 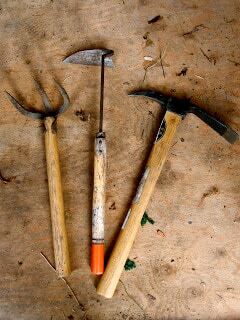 Whatever the cause, I have found that these three tools, plus my Felcos, can handle about 80% of what my garden can dish out. I work fertilizer, compost and lime into the top three or 4 inches of the soil with the fork, often while siting on the edge of a raised bed. I do a once-around with the hoe a few times each season to keep the weeds from competing too aggressively with the vegetables, and I use the pick-mattock to bust grass up from between paving stones, ferret out the bigger and tap-rooted weeds, and dibble holes for transplants. The only thing these tools can’t do is bust sod and break up deeply compacted soil – got to stick with the garden fork, spade, and full-sized mattock for those tasks – and sculpt a fine, even seedbed – the bow rake will never be replaced for that job. But once your soil is prepared, keeping it in good shape with the light touch of hand tools is kinda fun. Another thing I like about working primarily with small tools is their portability. If, as you read this, you are saying, “Well, duh, Erica, of course small equals portable” I will not hold that against you. However, as an easily distractible garden I’ve been known to lay down my shuffle hoe to complete a garden task only to forget where the hoe was set and lose it for the better part of a month amongst weeds. So I can assure you that a tub of small tools that can move with you (in a bright color – mine is red), and kept basically glued to your side, does cut down on mislayed tools. I am not throwing out my full-sized hoes and forks and spades, but I do find that those tools stay in their rack in the shed for all but the most considered job these days. It’s just so easy to pull the red tub full of my small-scale essentials out, and the job they do is so good that I have less need for the big gun tools. What hand-tools do you recommend for the garden? One of my best friends, who is also staying with us, brought her handheld pick-mattock, and OMG is it the coolest thing ever? Her's has teeth on both ends. Hands down the best weeding tool I've ever used, especially with Bermuda grass. I like the idea of a red bucket for carrying the tools…I'm forever losing my hand tools around the garden, only to find a rustier version weeks/months later, if at all. I love the concept of those hand-held hoes, but discovered when my Korean friend lent me hers that they don't work well for left-handers as the blade goes the wrong way! I wonder if they make them for lefties…. I, too, love my Felco pruners, which were a gift 16 years ago and are still fabulous. Other than that, my favourite tool, going back to my days landscaping, is a hand held flat fork. I love it as you can use it tines down to scrape or tines up to dig, or on an angle to 'ruffle' the dirt, which is a great way to get small weeds loose. A very versatile tool that gets used every time I'm in the garden. The Japanese make damn fine gardening tools. My favorites are the San-Kaku hoe and Hori-hori knife. Keep the San-Kaku sharp and it cuts through weeds like butta, all without having to bend over or sit on the ground. The hori hori is great for transplanting as it can both dig and cut. Not a hand tool, but for bustin' sod, you really should try the grub hoe, it is superb! Hi there ~ I've been reading (and enjoying!) your blog for a little while now, good stuff here. Thought I'd chime in with my vote for Hori-hori knife as my most fave hand tool. The one I have is NOT the wooden handled type (too heavy, too clumsy) but one whose handle is ergonomically designed with a dense **bright orange** plastic handle and much less weighty than the ole wood one, too. I use it mainly for weeding.